THIS Is How The Universe Looks Like In ONE Image! Have you ever tried to imagine the whole Universe? How does it look like? It’s rather hard to imagine something so enormous, but it’s not impossible. 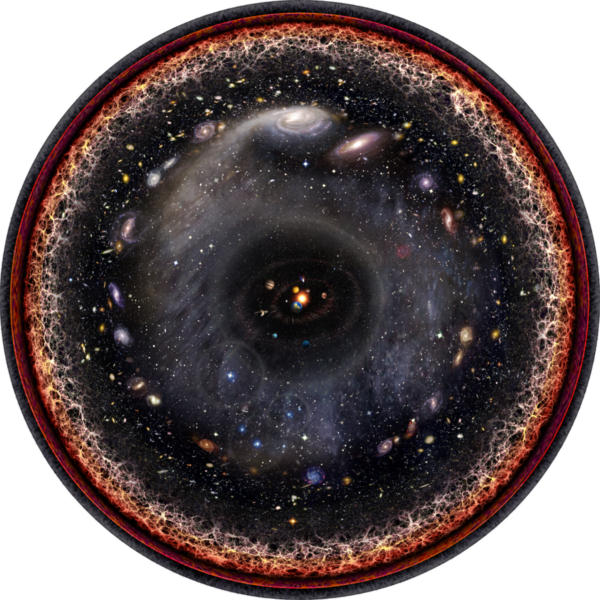 Using logarithmic maps of the universe from Princeton and images from NASA, Pablo Carlos Budassi created an image that shows the observable universe in one disc. The image looks like an eye, doesn’t it? It’s normal considering it was inspired from images created using a telescope. The truth is, The Universe probably doesn’t really look like this. Or maybe it does. My point is that nobody knows for sure. We are looking to find how it really looks, but every image we can create is filtered by our human mind. Maybe the true form of The Universe cannot be grasped by our mind, or maybe it doesn’t have a true form. Even more, The Universe might look differently for each species, depending on what sense they lean most on to. The Universe might look differently if observed from different star systems and galaxies. In order to truly grasp the real look of the whole Universe we might need to think 5 dimensionally, beyond time and space. My point is that we might never find the true form of The Universe but we can always imagine. We can always have a human concept that inspires us to wonder. That’s what expands the limits of what we can grasp. That’s the purpose of these images.